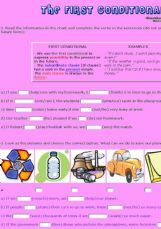 It�s an activity to practise the first conditional in the context of environmental issues. I hope you find it useful! It�s my fourth activity on conditionals. This time, the conditionals are all mixed. 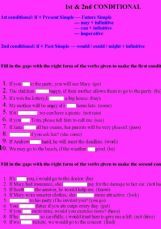 Students have to decide which conditional to use, the first, the second or the third. I hope you find it useful! 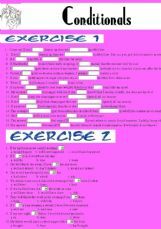 It�s an activity to practise the second conditional in a context. I hope you find it useful! 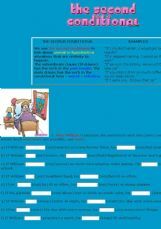 It�s an activity to practise the third conditional in context. I hope you find it useful. 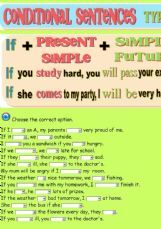 EASY WAY TO PRACTICE FIRST AND SECOND CONDITIONALS. 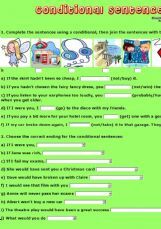 Thi is designed to practice "if clauses"
Students have to fill in the gaps to make a story. Lots of practice for putting verbs into the correct sentence. Then they write they own story.